Ariana Grande’s mum had a strong message for fans and concertgoers at the One Love concert last night and proved she wasn’t going to let anything stop them from having fun. Ariana’s mum – Joan – had been at her Manchester concert on 22nd May when the horrendous bomb attack took place – and showed what a dime she was by ushering shocked children and fans backstage. So, at her daughter’s concert organised to raise funds for the victims’ families, she showed she wasn’t going to let fear and hate destroy her, or anyone for that matter and chose to get involved on the ground. Instead of shying away backstage, pictures emerged on Twitter of Joan delivering a message of hope to the many young fans who had been at Ariana’s first concert and were now watching her tribute performance. Joan mingled with her daughter’s fans, telling them ‘do not be afraid,’ as they eagerly awaited performances from the young star, as well as Katy Perry, Miley Cyrus, Take That, Black Eyed Peas and a surprise appearance from Liam Gallagher. It was the first time Ariana Grande had performed since the depraved suicide bomber detonated his explosives during her concert, killing 22 people and injuring 100 more just two weeks ago. Keen to show unity and defiance, Ariana’s mum, as well as her boyfriend Mac Miller – who performed on stage with her – came along with the 23-year-old to show their support and to pay tribute to those who lost loved ones. The concert was a huge success, raising more than £2million for victims’ families and showing that acts of terror and hatred were not going to divide people. In fact, it did quite the opposite by bring people together and proving the city would not be cowed. An incredible job on Ariana’s part for organising and for all of the artists who put on a sterling show to pay their respects and to honour those lost on that deadly night. 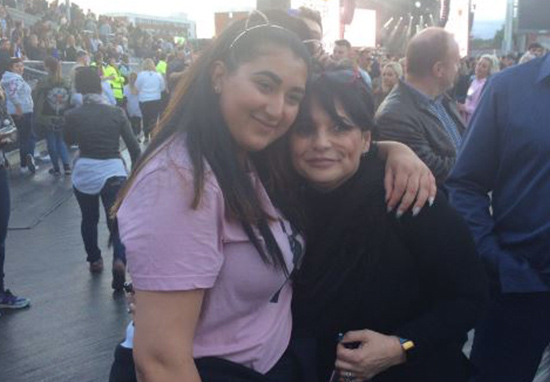 Ariana Grande's mum walked through One Love Manchester crowd telling fans "do not be afraid"